I have always been drawn towards the magnetism of truly wild places, those rare and disappearing enclaves that due to remoteness and landscape are still largely untamed by man. Places where life beats to an ancient drum and dense forest cloaks mystery, beauty, and danger. With the disheartening rate of deforestation and population growth, the wild can seem more like a historical artifact or movie set. However, these places really do exist and with a good deal of determination you can explore them. We set out in the La Moskitia region of Honduras to do just this. Named Central America’s first UNESCO World Heritage Site, the Rio Platano Biosphere Reserve is a place of jaguars, traditional tribes, and undiscovered archeological sites as well as lawlessness, poachers, and armed settlers all spread across mile upon mile of largely untouched primary rainforest. Here we would discover the wild beyond where the road finally ends. We began loading the trucks before dawn for our journey to the end of the road. It would be well past dark before we would arrive. We were treated to four hours of pavement before the road narrowed, our pace slowed to a crawl, and we bounced and lumbered through farmland, villages, mountainsides, and pine forests. Shacks made of sheet metal, dried mud, and stone dotted the roadside. In their yards, women hung laundry and barefoot children chased around chickens while pigs and cattle lounged in the sun. Local Campensinos with wide brimed hats shadowing their face from the bright midday sun rode horses to and from their fields with machetes slung over their shoulders. Eventually we stop beside a river where two of the guides would be departing to meet another group. At this point our guide, Jorge Salavatarri hops in our truck. Jorge is a passionate conservationist, an avid birder, and with 25 years experience he is the Rio Platano’s most experienced guide. The next several hours are spent listening to Jorge inform us on all matters Honduran. Jorge speaks candidly about the problems which threaten the livelihood of both the Honduran people and their land. Although Honduras has remained a staunch ally of the US, a follower of free market capitalism, and was untouched (relatively) by the leftist insurgencies and civil wars that engulfed most of Central America in the second half of the twentieth century, it has largely been left behind in the region’s albeit modest modernization. 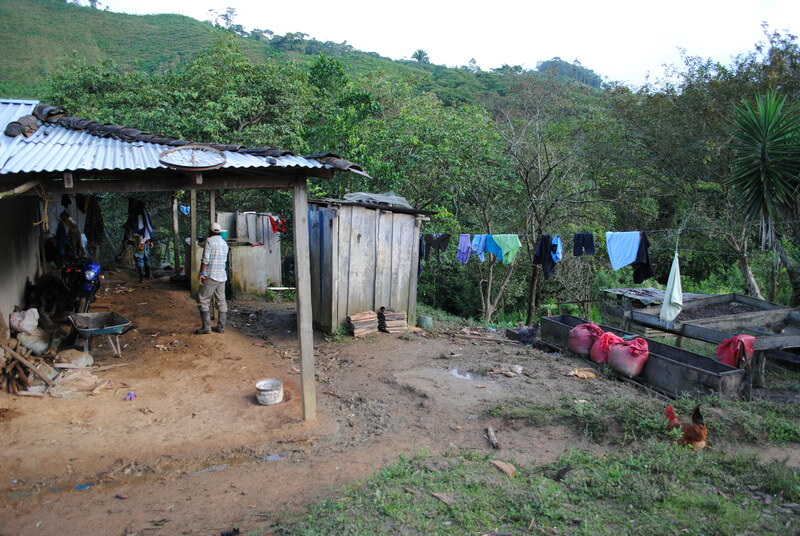 Honduras is Central America’s poorest and most violent nation. ***I think it is appropriate to diverge briefly at this point. While Honduras is statistically rife with crime and gangs, as travelers we witnessed absolutely no evidence of this. Of course a traveler would want to take certain precautions here (avoid being out after dark, don’t walk alone, ect) however crime is largely contained within specific neighborhoods and areas (primarily urban) where tourists are unlikely to be. Laura and I felt safe and completely at ease during our time in Honduras. I really don’t want to dissuade anyone from visiting what was our favorite country of the region. However, it would be impossible to convey the pressures upon the Rio Platano and its people without some background of the social and political climate of the country as a whole. Much of the problem can be attributed to the international drug trade. Neither producers, consumers, nor traffickers of drugs have thrown the common Honduran into the center of a war. 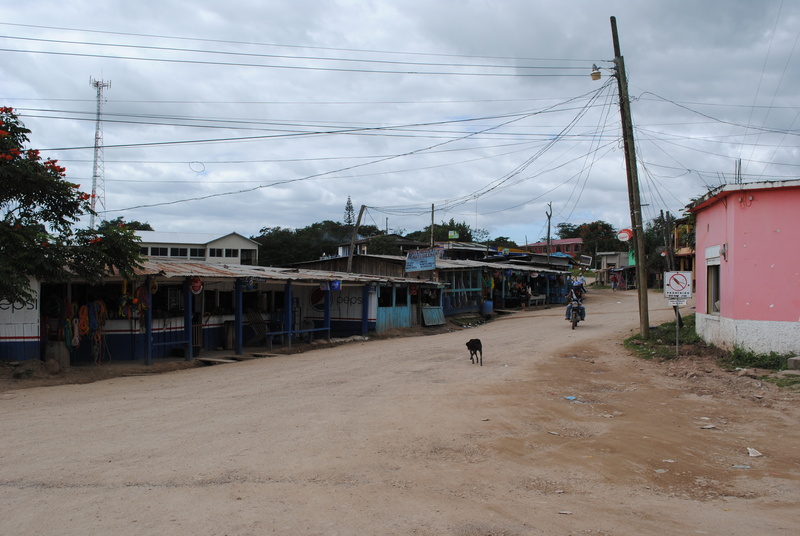 Rather, geography and economics are to blame for Hondura’s disparate situation. Columbian cocaine producers send vast shipments of narcotics into Honduras’s unguarded frontiers. From here, Mexican cartels working in association with both Honduran gangs and police transport the shipments overland to the United States. In fact, sections of the muddy road our truck sloshed through are, in the dry season, graded smooth by bulldozers and lined with generator powered lights. Now a working airfield, Columbian planes touch down here to quickly offload their cargo into waiting trucks that will pass through countless corrupt police and border checkpoints on their long drive north. Substantially out gunned and out funded, the Honduran government struggles to keep up. While drug trafficking is certainly a cataclysmic issue for the country to tackle, Jorge places much more emphasis on Honduras’s central more systemic issues, corruption and the absence of rule of law. Known murderers walk the streets while police turn a blind eye and the powerful employ criminals to intimidate rivals. Often less populated places like La Moskitia have an almost complete absence of police protection. Every level of government siphons off the meager public funds and exercises its personal interests. For instance, in Jorge’s opinion, the Rio Platano Biosphere receives enough money in foreign aid each year to sufficiently secure the park. However, this money is usurped by Bureaucrats who hold conventions in Tegucigalpa, produce academic papers, and fund exhaustive aerial services without ever stepping foot between its boundaries. Although Jorge has a very acute grasp of the serious troubles facing his country, he would never consider Honduras helpless. Jorge is overwhelmingly positive. He is a man who believes in solutions. He has simple specific ideas for how to secure the Rio Platano. He believes ecotourism and shrewd land management can help rescue the nation’s suffering economy. Drug trafficking can be curbed by increased military checkpoints along roadways. When it comes to corruption, he believes his countrymen have finally had enough. A recent scandal involving the murder of a prominent academic’s son by police had been the last straw. Jorge seemed confident that his country could root out corruption. 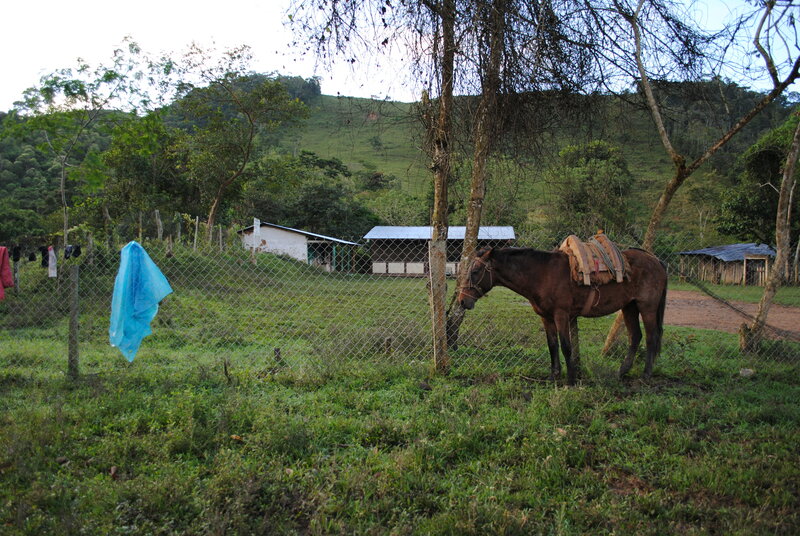 Though pragmatic, Jorge was also exceedingly confident about the health of Honduras’s wilderness. He lamented the array of animal life within the country as well as the vast swathes of untouched wilderness. As evidence we could glance out our windows at the cloud forested peaks Parque Nacional Sierra de Agalta which would be on our side for the next several hours as we drove in a giant U around the impassable mass. It was late in the afternoon when we stopped in the regional capital of Catacamas to purchase what would prove to be two indispensible supplies, Wellington boots and rum. From town we drove several more hours before we would reach what was quite literally the end of the road. We were immediately grateful for our new boots as we sloshed through the ankle deep mud and standing water. We would be spending the night at a small farmhouse. Arriving in the main room, several people were milling about expectantly and the walls had been decorated with streamers. Very few tourists enter the park from this section and it is unlikely that these local farmers receive visitors much more than once or twice a year. After another dinner of eggs, beans, and cheese we lay down to a cold wakeful night on the cement floor. The next morning, after another breakfast of eggs, beans, and cheese, our rafts, gear, and supplies are loaded onto mules. 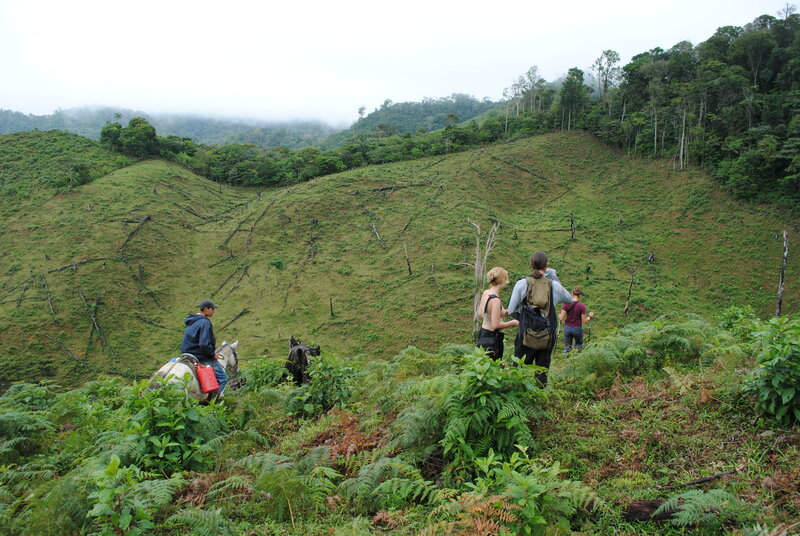 It will be a full day’s hike to the source of the Rio Platano, and because it is the middle of the rainy season, is deep enough to begin our journey. Only several years before, the forest abutted the farm. Today we would have several hours of hiking before we entered the primary rainforest at the biosphere’s border. The area in between was comprised primarily of tall mucky grass pockmarked with the occasional stand of trees. Cattle roamed freely here often stubbornly blocking the trail. Coming over a hill, we finally looked across at the edge of the last clear cut and on the other side stood a massive wall of vegetation. Never before had the line between man and nature, purity and destruction been so despairingly poignant. I headed toward nature, toward purity and ducked into the dark canopy of the Rio Platano Biosphere. This is the first in a series of posts based on an eleven day rafting expedition to the Rio Platano Biosphere in Honduras during the winter of 2012. Our trip was organized through Jorge Salvaterri of La Moskitia Eco Adventures (https://www.facebook.com/moskitia). They offer a variety of well guided trips throughout the region.